Evan was diagnosed with ALL when he was two and a half. He was on the verge of acute heart failure and was close to suffocating during his cancer treatments. Estrella and Evan met with Mrs. Terri and Mr. Noah, the senior instructors for Middleburg Yesha, and a bond was instantly formed. Evan was welcomed with open arms. Evan grew emotionally, socially, spiritually, and physically. He became more disciplined and developed strong relationships with the senior instructors, the students, their families, and the entire Yesha-wide organization. As a result of Evan’s formed relationships, his entire family, including his sister, Sophie, also forged close relationships with all the instructors, students, and family members. Evan and his family were blessed to become a part of the Yesha family. Evan’s father, Michael, is not only the class administrator for the Middleburg school but a Greenbelt student. 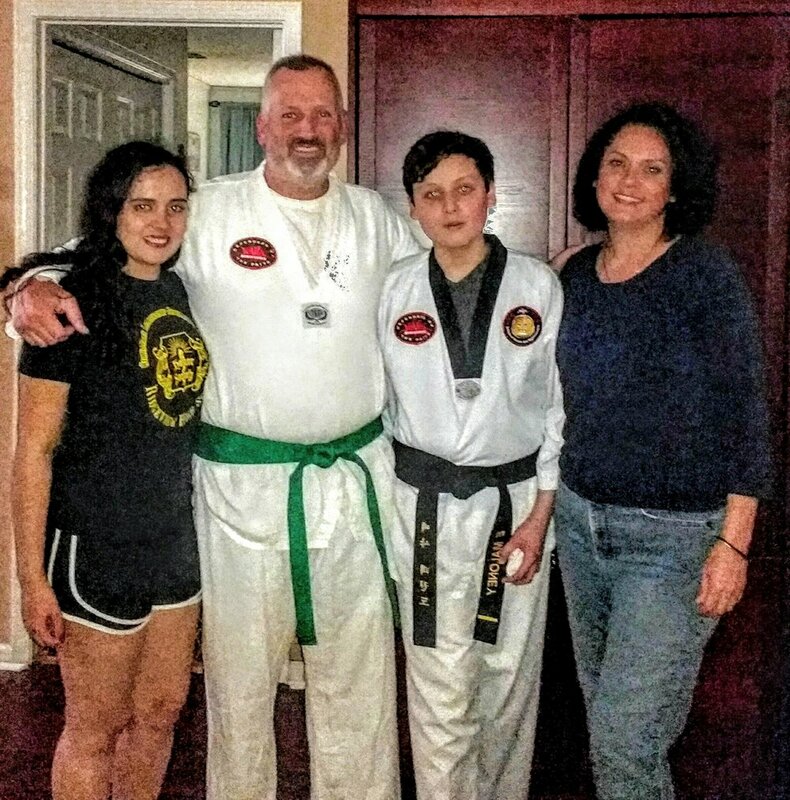 Evan, despite his hardships of chemotherapy and the assorted cancer compilations, never gave up and achieved his Black Belt, 1st Dan, at the age of 12. Evan is gladly able to “be in charge of his father” during taekwondo classes. Evan is proudly a junior instructor, role-model, and leader. Evan has shown self-control in many difficult situations. He has displayed the tenets of taekwondo and emphasizes these traits, not only during his class instructions but also at school. Evan has continuously demonstrated courtesy and love to all people, as he has shown an immense amount of empathy and sympathy for those less fortunate. Graciously, he volunteers to assist in community functions. Evan has informed his parents that he is this way because of what he has experienced with cancer. Evan has persevered with an indomitable spirit over his medical complications. Yesha became a crucial part in assisting Evan with dealing through the process of living with cancer and post-chemotherapy treatments. Evan intends to continue with Yesha as a junior instructor and become a senior instructor later in life. Evan is working towards his Black Belt, 2nd Dan. Yesha has been with Evan during his formative years and during times of struggles and victories over cancer. Yesha will always be a part of Evan and his family.